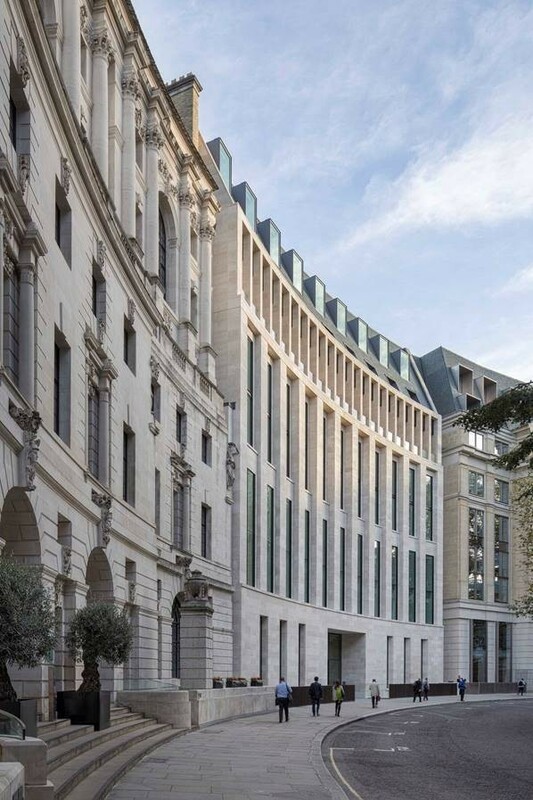 ORMS Architecture Design has completed the £14 million development 26 Finsbury Square (formerly Finwell House), a prominent office building that lies on the corner of Finsbury Square, East London. ORMS’ design for the Freshwater Group of Companies’ has incorporated a number of energy efficient measures as well as a full internal refurbishment, and the redevelopment of the building’s exterior. The 1950s building was modified in the 1980s and ORMS’ contemporary redesign further complements the architectural language of the square and improves the surrounding area. The 1980s front section of the building was demolished in order to rebuild a slightly larger footprint – the design adds 20% additional floor space to the building – and create a new Portland stone and glass façade in keeping with the scale and design of the new and old buildings in the vicinity. The lower two levels of glazing are set back, forming a colonnade and adding richness to the experience of the building at street level. Office floors at the 8th and 9th level have been rebuilt in order to benefit from extra ceiling height and light and a light-well has been incorporated at ground floor level, in order to increase light for the lower ground floor office space. 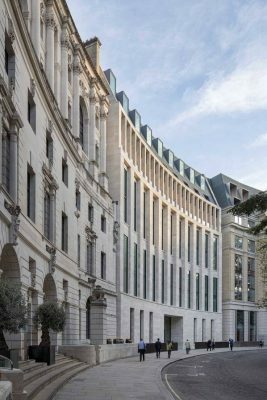 The four facades have been clad in Portland Stone and clear glazing creating an elegant and modern addition to Finsbury Square and enabling a view into the double height reception hall from the square. A basement to the rear of the building now houses the renewable energy resources as well as providing bicycle spaces and associated showers. ORMS’ design has adopted the Mayor’s Energy Hierarchy and appropriate measures have been implemented to reduce energy demand and to increase the efficiencies of the systems. Resources such as a heat recovery system, solar control glass and a variable volume pumping system have been incorporated. The scheme provides 20% of its energy demands from renewable sources and the building has achieved a BREEAM ‘Very Good’ rating.